This av amp has good sound but the quality construction of the unit is poor. The main power supply board died after 3 years of normal everyday use. I opened and fixed it by replacing 2x bridge rectifiers, 2x 10000uf/63v main capacitors, a blown fuse & 2 resistors but i know electronics. That is what happens when good companies like DENON move their production lines to China. Cheap & crap quality electronics inside. For some extra cash you can buy a better model . Do not be impressed by the sound. This is good quality receiver. Impressive middle range,impressive panorama.I could compare this receiver with SONY-STR790,SONY STR-DA1000ES, MARANTZ SR5500. 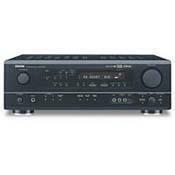 DENON has very good panorama on music and movies,easy to setup this receiver,but,-one minus! This receiver little-bit unnatural in the bass. Bass is no deep but its "dimly" deep,not clear and tight. SONY DA1000ES and SONY STR-790 has more even and tight bass. And,of course,MARANTZ 5500. Overall rating for this receiver- 4. I read a lot of excellent review about DENON receivers,- but,I have my strong opinion based on my experience-this receiver is good but not the great. This is the best 6.1 A/V amplifier I ever seen in my life for the price I paid. I strongly recommend to purchase this amplifier even if it is obsolete. Plenty of Power, easy to use, decent sized display, compares very well with similar priced units from other mid-fi companies.. I think it sounds better than the RXV540 from Yamaha and is dead even with the more laid back 502 from Onkyo. None really for the price point.. a backlit remote should be included. Having been a Denon fan for many years, I decided to by this unit and see how it performed. I hooked it up to my 3 Kef Q15.2's, Celestion MP1's for the rear and an Athena ASP-400 Sub. I use a Toshiba 36" TV. Set up was relatively easy, though the Japanese to English translation has always been sore spot witn me regarding the op manual. The Denon's D/A's are good and provide an excellent soundstage. The center volume needs to be carefully adjusted for effective dialogue presentation though. Bass out put was very good only limited to the Athena's placement in my room. I did measure output down to 36Hz. Plenty of Power, easy to use, decent sized display, compares very well with similar priced units from other mid-fi companies.. I think it sounds better than the RXV40 from Ymaha and is dead even with the more laid back 502 from Onkyo. Having been a Denon fan for many years, I decided to by this unit and see how it performed. I hooked it up to my 3 Kef Q15.2's, Celestion MP! 's for the rear and an Athena ASP-400 Sub. I use a Toshiba 36" TV. Set up was relatively easy, though the Japanese to English translation has always been sore spot witn me regarding the op manual. The Denon's D/A's are good and provide an excellent soundstage. The center volume needs to be carefully adjusted for effective dialogue presentation though. Bass out put was very good only limited to the Athena's placemtn in my room. I did measure output doen to 36Hz.